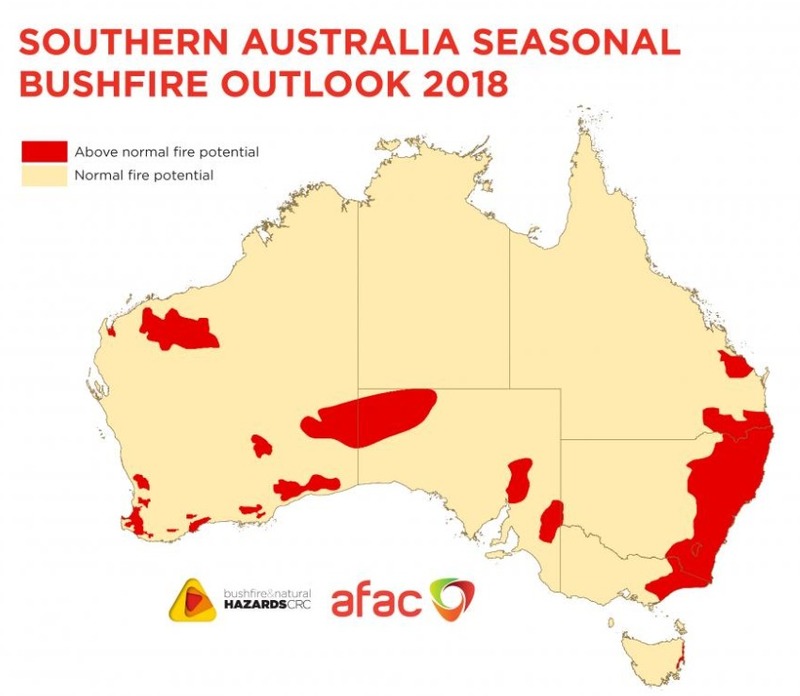 ALMOST all of New South Wales remains in drought despite recent rainfall, and large parts of southern Australia face above normal bushfire potential over the coming months. The NSW Department of Primary Industries today released the latest State Seasonal Update, which indicated NSW received welcome widespread rainfall throughout August; however 99.8 percent of NSW remained in drought. And the Bushfire and Natural Hazards CRC this week released the Southern Australia Seasonal Bushfire Outlook 2018 which showed fire potential across New South Wales, the ACT, Victoria, Tasmania, South Australia and southern Western Australia and Queensland. NSW DPI’s leader of climate applications and digital agriculture, Dr Anthony Clark said the recent rainfall is a positive start but totals were still average to very much below average across most of the state and drought conditions continue to be experienced. “Significant falls occurred for parts of the Central Tablelands, North Coast, Northern Tablelands and a small area of the Western region around Bourke. “Reasonable falls were also recorded to the north of the South East region, the east of the Murray and Riverina regions as well as north of Singleton in the Hunter region,” Dr Clark said. “Parts of the state had minimal rainfall throughout August including much of the Western region, the western area of the Central West region, the area around Walgett in the North West region and areas south of Singleton in the Hunter received little to no rainfall,” he said. “While the rain has been welcomed and has provided a more positive outlook for field conditions in some regions, the drought is far from over,” Dr Clark said. The Bushfire and Natural Hazards CRC said with much of southern Australia experiencing a combination of above average temperatures and below average rainfall this year, combined with the forecasts for spring, suggest that the southern fire season is likely to commence earlier than usual and be more active than normal.